The Cincinnati Observatory…Check it Out!! 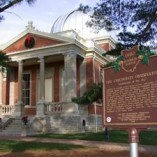 written by: FathComments Off on The Cincinnati Observatory…Check it Out!! The Cincinnati Observatory is proclaimed one of the most epic institutions in The United States. A fully functioning center used by the community, teachers, organizations, and many others. As the home of the worlds oldest telescope it attracts the general public and tourist.